11 " Ceramic Leyland Clutch Plate Assembly - J Charnley & Sons. 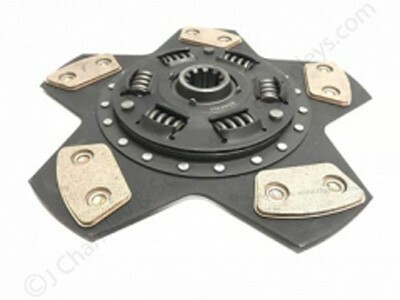 Originally designed for Leyland Tractors as a special fitment for use with the Borg & Beck 11” x 11” dual clutch. Fitted to Leyland 282 and Leyland 482 Loader tractors and Turbo tractors. This 11” diameter disc has five pairs of ceramic pads which are set at an angle. It has a spring cushioned drive centre hub with a 1.1/8” diameter spline shaft. This plate is also ideal for ‘Road Run’ tractors or ‘Show’ tractors as the ceramic pads are less likely than organic plates to stick to the flywheel if the tractor is stood for long periods. More info here AAU2906 CLUTCH PLATE.